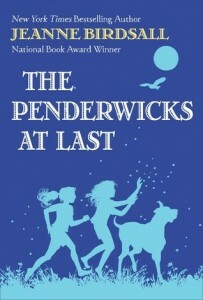 Nine years, five older siblings, a few beloved dogs, and an endless array of adventures--these are the things that have shaped Lydia's journey since readers first met her in The Penderwicks in Spring. Now it's summertime, and eleven-year-old Lydia is dancing at the bus stop, waiting for big sister Batty to get home from college. Our story opens with a phone call. Skye has decided to have her wedding at Arundel - where it all began. So, we return to memories, to looking back and a lot of remembering the before and figuring out the now. There are goodbyes that make life horrible and sad. But life has a way of going forward that brings happiness into the now and of course, the Penderwicks have happiness running over. A lovely story about relationships and hopes and dreams and getting along and life as it should be or at least as we wish it could be.